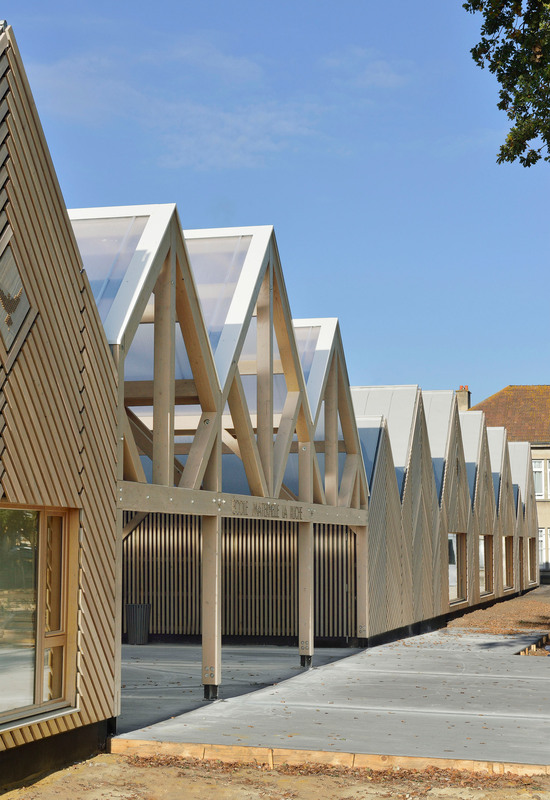 A long run of gabled volumes clad in honey-coloured wood has been designed by Tracks Architectes for a kindergarten in France called La Ruche, which translates as The Beehive. La Ruche is located in the village of Perthes-en-Gatinais, and the project borrowed its simple geometry from the local architecture. Each pitched unit sits on one level, with widths and lengths altered slightly depending on internal requirements. The kindergarten is in an area that is part of the Gatinais Regional Natural Park (PNRGF). Given the bucolic surroundings, the school buildings have been designed to be as visually generous as possible, looking out to a small wooded promenade to the north and an educational garden space to the south. Construction was completed in just 10 months to minimise disturbance to the park. Insect and animal motifs sit on each gable, and are used inside the kindergarten as a signage system. Internally, simple wooden cladding and white walls creates bright, open spaces. Skylights work with the gable windows to draw in as much natural light as possible. 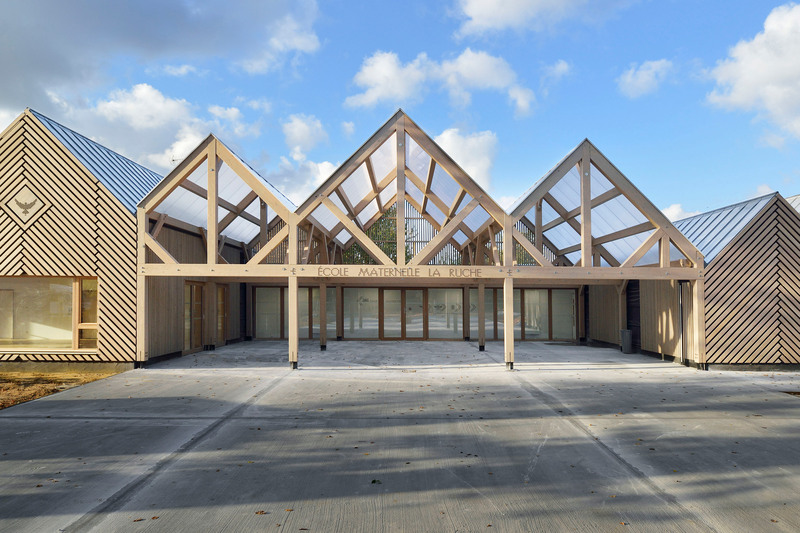 Each form is finished with timber-plank cladding, arranged vertically on the sides and in a 45-degree pattern to match the rooflines on the gables. 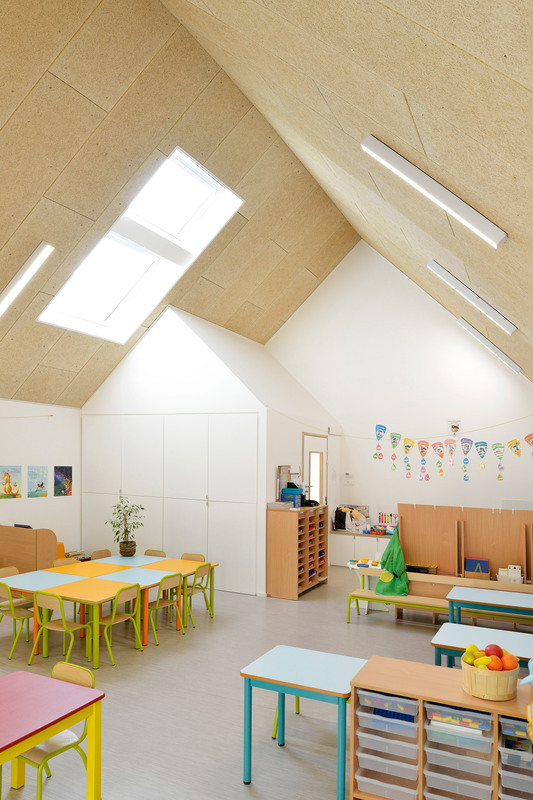 “The pitched roof of 45 degrees creates a house like a child would draw: simple, iconic, graphic,” said Tracks Architectes. The area surrounding the kindergarten was already a well-used public route, and the architects sought to continue this with a linear layout. 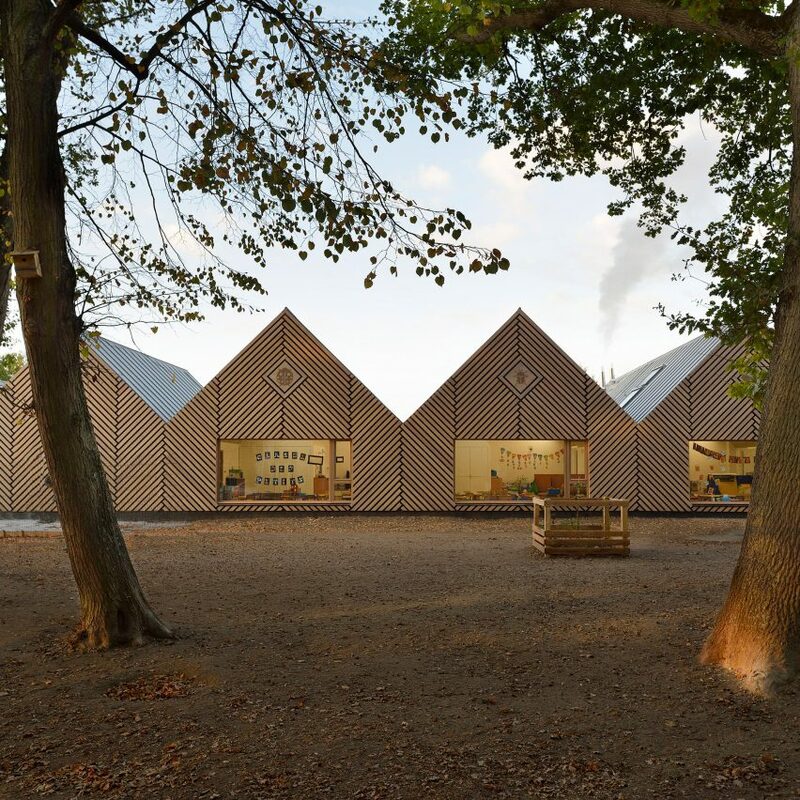 At the centre of this run of buildings is a wooden framed opening that creates a covered yard extending into the playground and garden, connecting the two sides of the site. A similar area to the east of the plan provides a covered parking area. 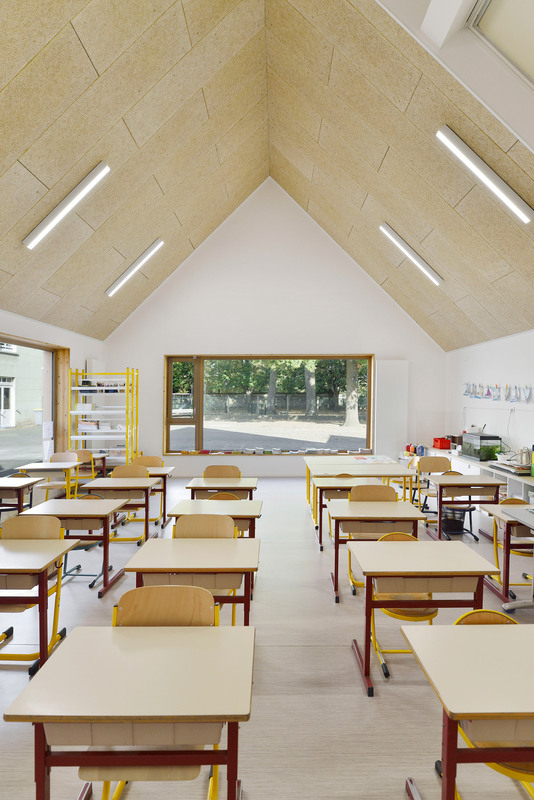 Schools with forms inspired by the naive drawings of children are a popular choice for architects around the world. In Japan Hibinosekkei designed a nursery with house-shaped windows punctuating a dark facade, and Masahiko Fujimori added colourful gabled bay windows to a kindergarten. Photography is by Guillaume Amat. 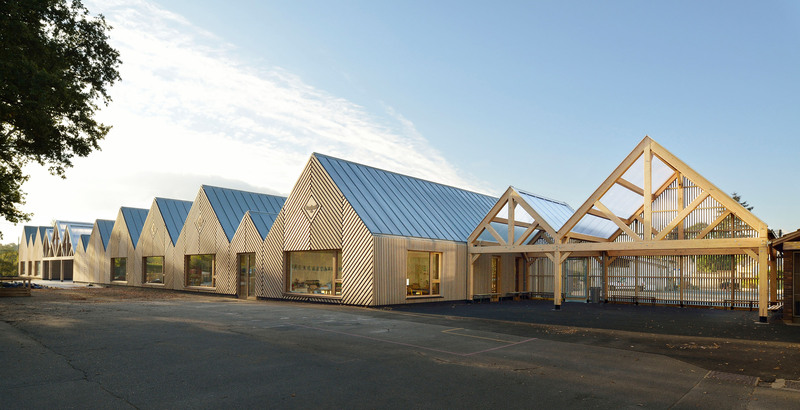 The post Tracks Architectes designs timber-clad kindergarten with gabled forms in France appeared first on Dezeen.